You are invited to the East Bay Health Workforce Partnership Medical Assistant/ Health Navigator/ Community Health Worker Workgroup meeting on May 7, 2019. The meeting will be from 9:00am-10:30am, location TBD. You are invited to the East Bay Health Workforce Partnership Behavioral Health Workgroup meeting on May 13, 2019. The meeting will be from 3:30pm-5:00pm. The location is yet to be determined. Please RSVP by emailing eastbayhwp@gmail.com. Earn & Learn works with over 20 school districts and community colleges in the Bay Area to make it easy for employers to provide internships, workplace tours and other work-based learning experiences that are transformational for students in developing career and college goals and providing them with social capital to create their professional networks. Last year we supported over 2,000 employers who provided experiences for over 20,000 young people. Join them in honoring Earn & Learn employers who are champions in connecting young people to high-wage, high-growth jobs and developing a stronger, local, diverse talent pipeline. For more information and to RSVP, please click here. You are invited to the East Bay Health Workforce Partnership Primary Care Workgroup Phone Meeting on May 29, 2019. The meeting will be from 9:00am-10:30am. Please save the date for our upcoming EBHWP Partners Meeting on Monday, June 10, 2019. When made available, we will share the meeting location, link to RSVP, and agenda. Until then, please mark your calendars. You are invited to the East Bay Health Workforce Partnership Medical Assistant/ Health Navigator/ Community Health Worker Workgroup meeting on August 6, 2019. The meeting will be from 9:00am-10:30am, location TBD. You are invited to the East Bay Health Workforce Partnership Behavioral Health Workgroup meeting on August 27, 2019. The meeting will be from 3:30pm-5:00pm. The location of the meeting is yet to be determined. You are invited to the East Bay Health Workforce Partnership Primary Care Workgroup Phone Meeting on September 10, 2019. The meeting will be from 8:30am-10:00am. Please save the date for our upcoming EBHWP Partners Meeting on Thursday, October 10, 2019. When made available, we will share the meeting location, link to RSVP, and agenda. Until then, please mark your calendars. You are invited to the East Bay Health Workforce Partnership Medical Assistant/ Health Navigator/ Community Health Worker Workgroup meeting on November 5, 2019. The meeting will be from 9:00am-10:30am, location TBD. You are invited to the East Bay Health Workforce Partnership Primary Care Workgroup Phone Meeting on November 8, 2019. The meeting will be from 12:00pm-1:30pm. You are invited to the East Bay Health Workforce Primary Care Workgroup Discussion about Clinician Burnout, Wellness and Retention. The meeting will take place on April 11, 2019 from 9am-10:30am. If interested in planning, getting involved or attending, please send an email or visit the ACHPP website. You are invited to the East Bay Health Workforce Partnership Primary Care Workgroup Phone Meeting on March 13, 2019. The meeting will be from 12:00pm-1:30pm. To register, please click here. Registration closes February 7. Join Alignment Bay Area Health Pathway A-Team to discuss upcoming funding and opportunities through new Strong Workforce Funding. The meeting will take place on Feb 14th from 10am-12pm at the Alameda County Office of Education Conference Room 142- 313 W Winton Ave, Hayward, CA. For more information and to RSVP for the meeting, click here. We're picking up where we left off from our meeting in the Fall by reviewing the key issues we identified in Health Pathways. We will also discuss joining our funding effort for an application for the K12 Strong Workforce Program grant, as well as align strategies that our team developed with strategies identified by local leaders in CTE. Lunch will also be served at the end of the meeting. Thank you for your commitment to Bay Area youth and being a champion for transformative change. We hope to see you there! Please save the date for our upcoming EBHWP Partners Meeting on Tuesday, February 12, 2019, where we will present on our accomplishments from 2018 and discuss next steps for the organization going forward. We will also have a special presentation on the CA Future Health Workforce Commission and a discussion on the integration of the Commission’s recommendations and our work moving forward. This meeting is sure to be full of valuable information for the partnership. You are invited to the East Bay Health Workforce Partnership Medical Assistant/ Health Navigator/ Community Health Worker Workgroup meeting on February 5, 2019. The meeting will be from 9:00am-10:30am at 1611 Telegraph Ave, in the first floor conference room. Our office is located between the 12th and 19th Street BART Stations. There is also street parking and nearby garages for parking. The first floor conference room is located to the right and down one step from the three steps leading to the check in desk for the building. There is a coffee machine directly opposite the conference room, please help yourselves. Join the West County Health Pathway Partnership at its next meeting on January 16th. This meeting will feature a presentation and discussion from the Richmond Workforce Development Board. Diversity in Health Training Institute will be hosting a healthcare career awareness workshop at 1900 Embarcadero, Suite 305, Oakland. Pre-registration is required to attend. Seating is limited and will be offered on a first-come, first-served basis. Lunch will not be provided for public attendees but will be provided to commission members, staff, and foundation staff. The ladder is a program to learn cool things about science and health careers for young people age 9-24 years old to learn about medicine, health careers, and ways to succeed in science! The event will take place at West County Health Center in San Pablo. We are excited to invite our colleagues, staff, patients and families, as well as our West County community partners and young people to join us for a fun-filled, hands-on session to learn about the EYE & HOW WE SEE!!! You will get to learn things like the anatomy of the eye, how we see color, how glasses help us see, or about our pupil reflex. Looking forward to seeing you and young people! Co-chairs of the WCHPP will meet to discuss recent events, work group initiatives and next steps, and the upcoming January 16th meeting for WCHPP. Please note: This meeting was formally a meeting for WCHPP members. that meeting has been moved to January 16th. AREAS OF FOCUS: PUBLIC HEALTH, MENTAL AND BEHAVIORAL HEALTH. Our partners are invited to participate in an upcoming Career Day event for Richmond High School Academy Students. The event will be on the morning of December 12th. The event will host a set of workshops for students that are interactive, with students learning something about the type of skills performed and the individual’s career path. For more information, contact eastbayhwp@gmail.com. AREAS OF FOCUS: SPORTS MEDICINE & REHABILITATION THERAPIES, NUTRITION, etc. Our partners are invited to participate in an upcoming career day for students at Hercules High School. This will be a half day event with students rotating through several workshops where they can learn about various health careers through some hand-on learning. Do you work in Human Resources at a Health Clinic or Hospital and Health System? Are you a Recruitment Director or Executive Administrator? 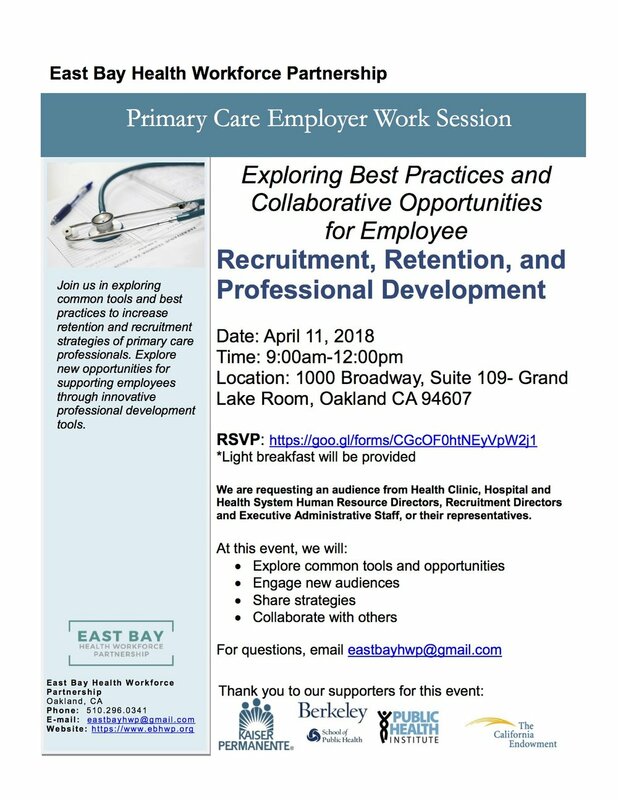 Join us on Wednesday April 11th in exploring common tools and best practices to increase retention and recruitment of primary care professionals. You are invited to attend the Winter/Spring 2018 East Bay Health Workforce Partnership Partners' Meeting on Wednesday, March 28, 2018. The agenda for the meeting is here. This will be an important meeting for us as we will be reviewing and discussing our draft Strategic Plan, the organization's blueprint for the next three years. It is important to have your input and consensus that the direction, goals, and implementation plan work for you. If you have any questions or concerns, I am available by email at eastbayhwp@gmail.com or by phone at (510) 296-0341. Our next MA/CHW/HN Meeting on Thursday, January 25, 2018. The genda for the meeting is attached. To RSVP, respond to the calendar invitation or email eastbayhwp@gmail.com. We will have coffee and bagels available at the meeting. Also, if you have not already done so, take a moment to check out our finalized report which was released earlier this week. Share the report with your colleagues, organization, partners, and others who may be interested by providing them with the link above or directing them to our website at: https://www.ebhwp.org/. If you would like a PDF copy or have questions, email eastbayhwp@gmail.com. Join the Work Based Learning Workgroup of the EBHWP.